Providence has been high on my list for a while now, and I finally got to try it today! Unfortunately, our reservation was for 9:30 p.m., and they apparently stop serving the 14-course Chef’s Tasting after 9:00 p.m. We settled for the 9-course, which was pretty solid. The service wasn’t too great. They didn’t make any mistakes or anything, but the waiters were pretty stiff—it made us feel a bit out of place. To be fair, we WERE underdressed; still, it’s LA! It should totally be fine for us to dress relatively casually haha. Maybe it was because we were really young? I dunno. 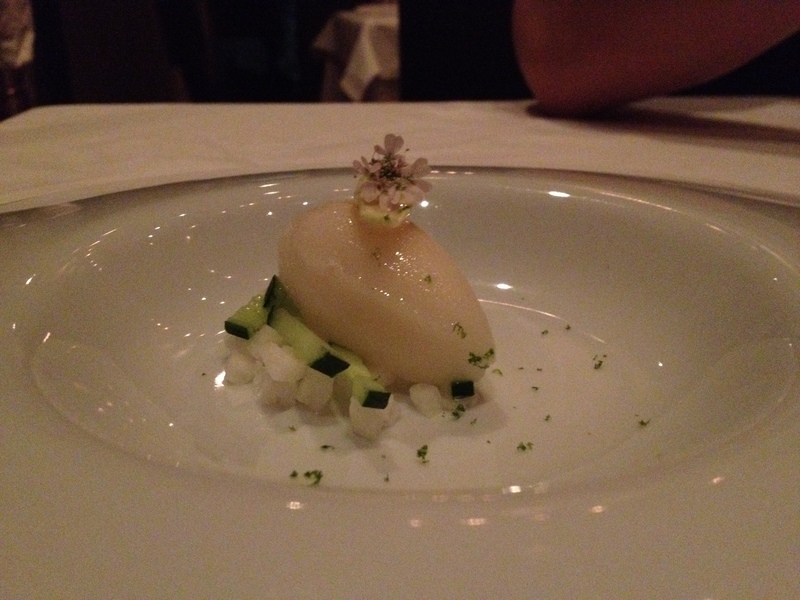 I really want to write more about the courses of this meal, but I can’t bring myself to do it. 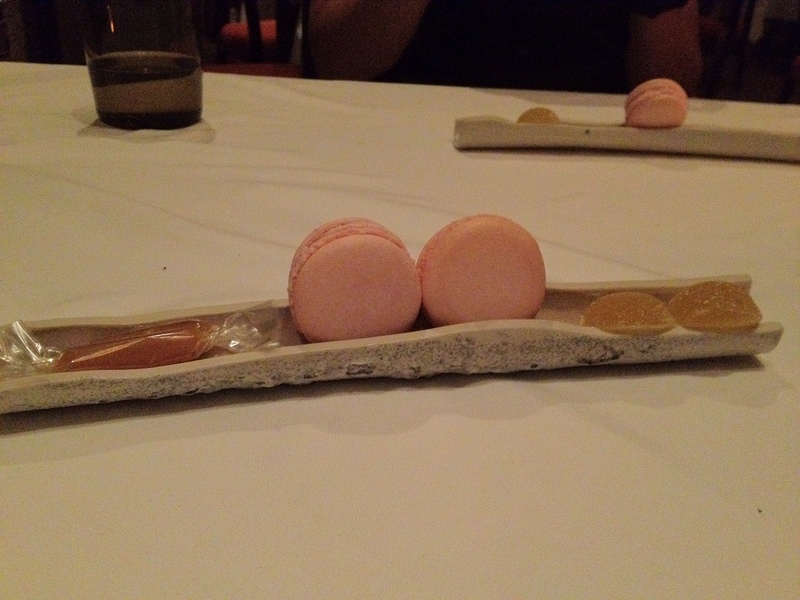 It was one of those weird meals where you KNOW the food is objectively really good… but it was just a bad experience. A lot of the dishes were solid and of the quality that you’d expect from a restaurant of this caliber, and there were definitely some amazing courses. Still… I can’t help but feel that I enjoyed the experience at Yamakase the previous night more. Gosling’s dark rum with Gosling’s ginger beer and ginger foam. 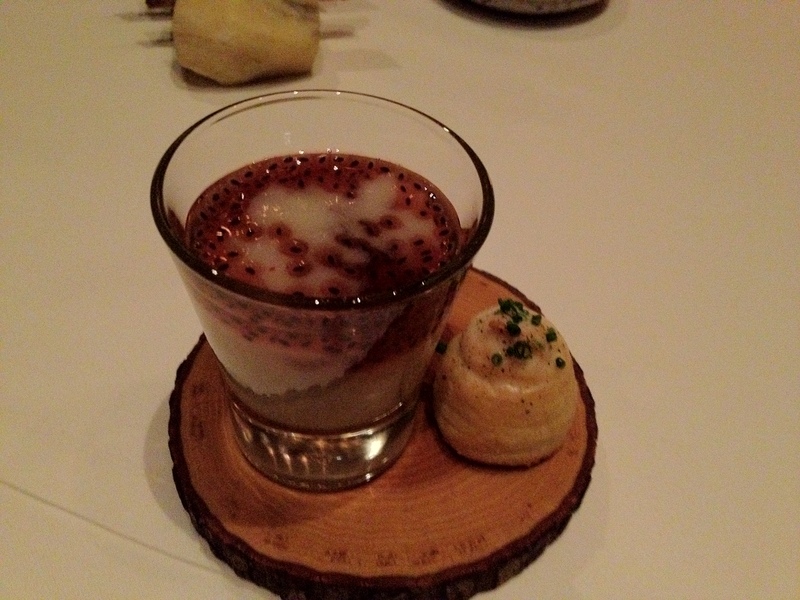 -Glass: Warm hibiscus juice with basil seeds at the bottom of the glass. Cherimoya soup is added. 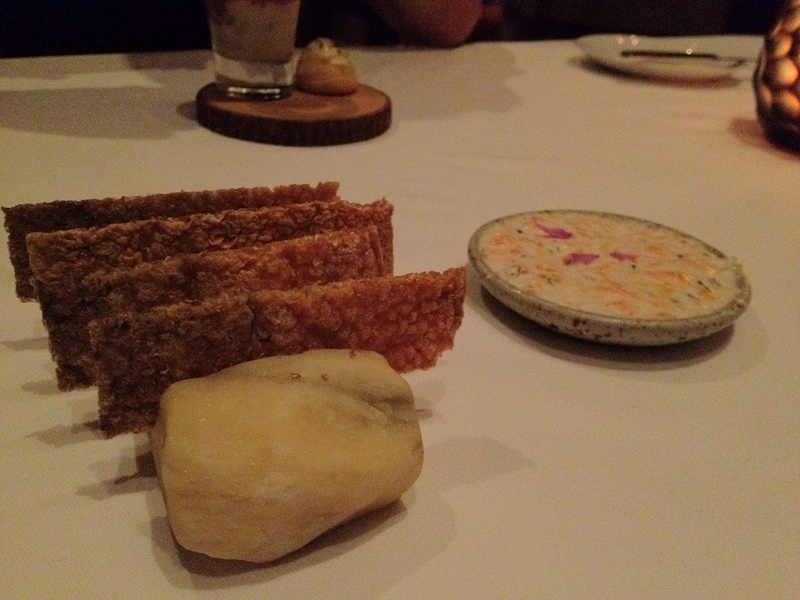 Smoked salmon skin chip with ocean trout mousse dip. Mmmm… Salmon skin… Delicious. And that mousse dip was really, really addictive—my friends vastly preferred it to butter for their bread haha. with cherry blossom dressing with shiso and pickled lavenders, heart of palm, and cilantro. 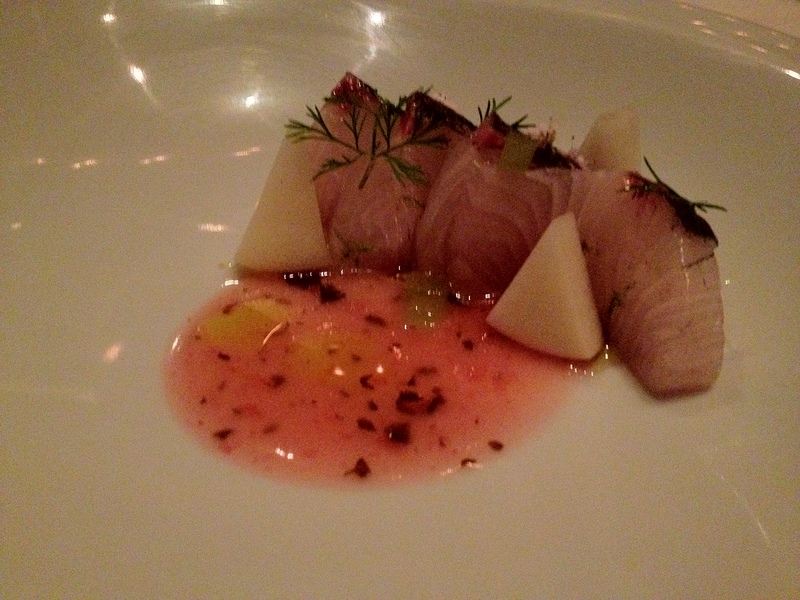 I really enjoyed the cherry blossom dressing—it added some welcome acidity that provided a nice counter to the kanpachi. I’m starting to really like extra acidity in my seafood courses haha; acidity makes it so much easier for me to eat a ridiculously large amount of fish. hiding beneath soft-scrambled eggs, brioche, and champagne beurre blanc. 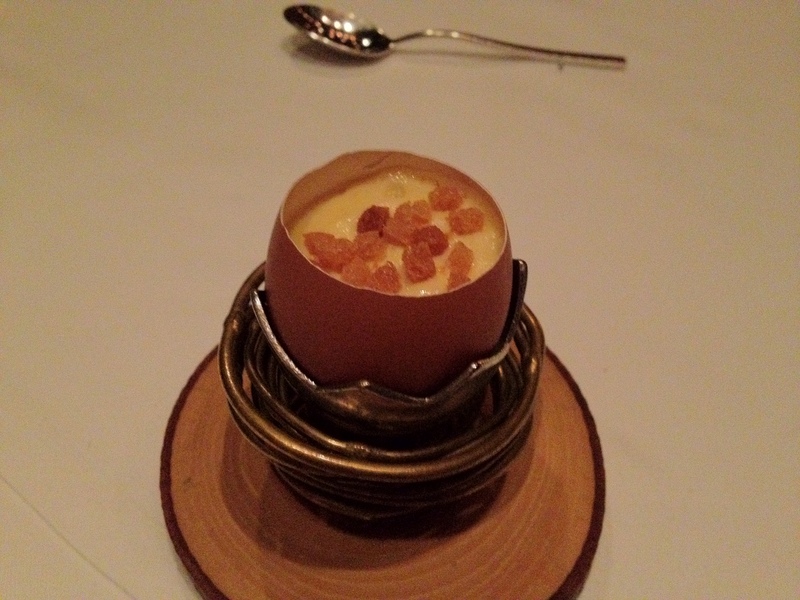 I really like these open egg shell dishes (like the ones in Jean Georges, Melisse, or Per Se). I LOVE eggs, and mixing the texture and taste of scrambled eggs with another ingredient I really enjoy (uni here, caviar at JG and Melisse, and truffles at Per Se) always makes me happy hahaha. 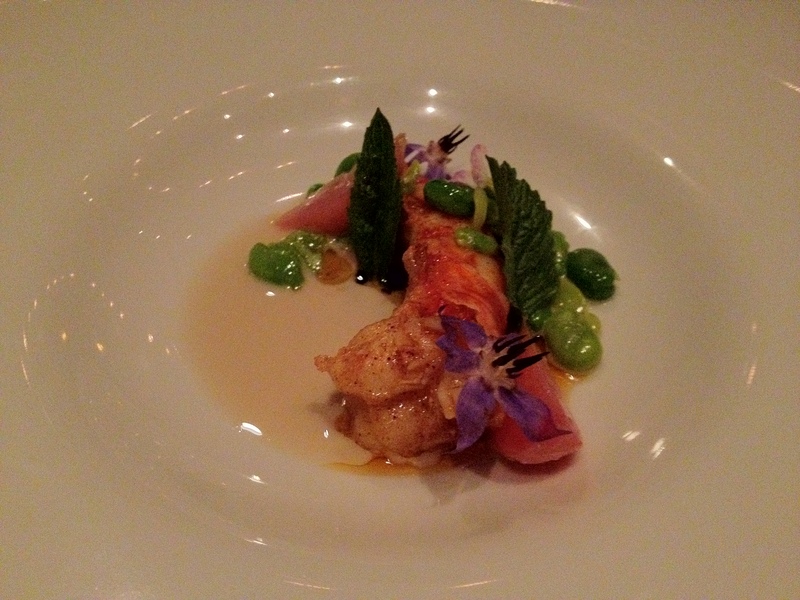 with petite favas, black bean, and prawn butter. 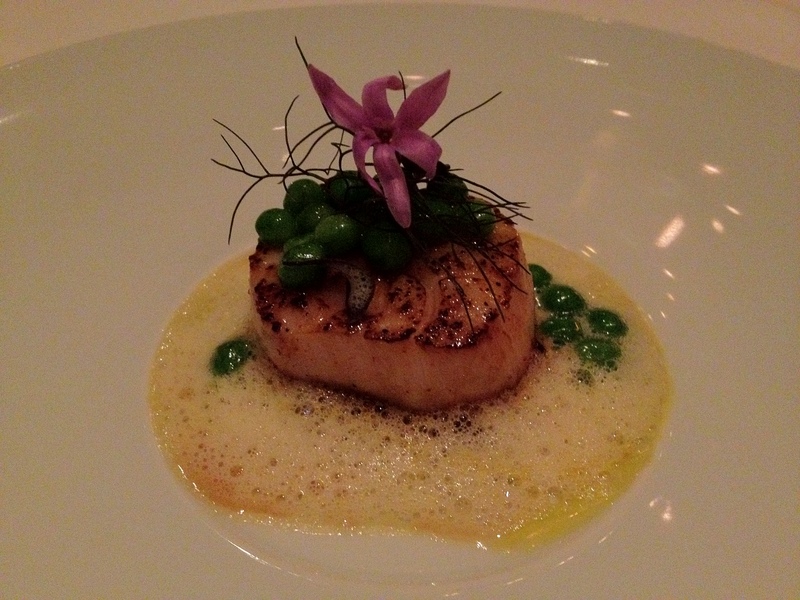 with fennel, English peas, and velouté. 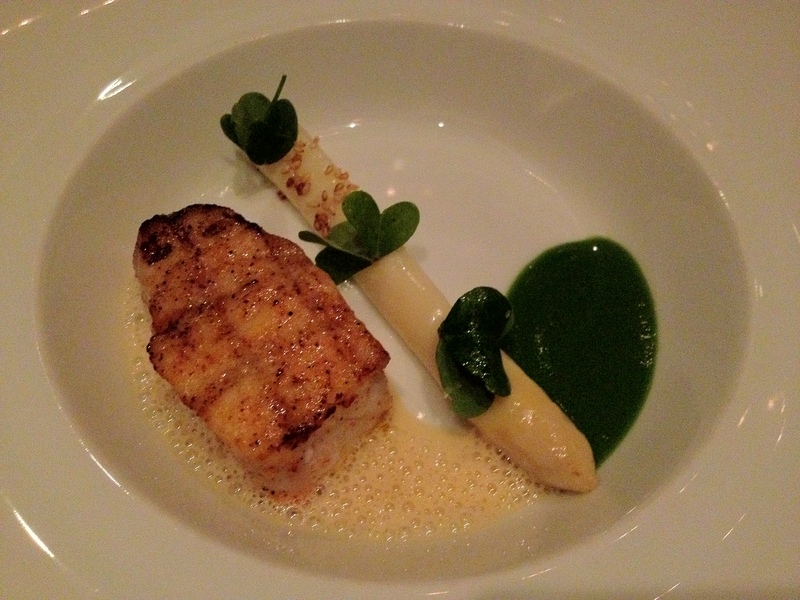 with Belgian white asparagus, smoked miso, and parsley–miso–green asparagus sauce. with black olives, salsify, McGrath Family Farm’s arugula, and potato hash (I think). 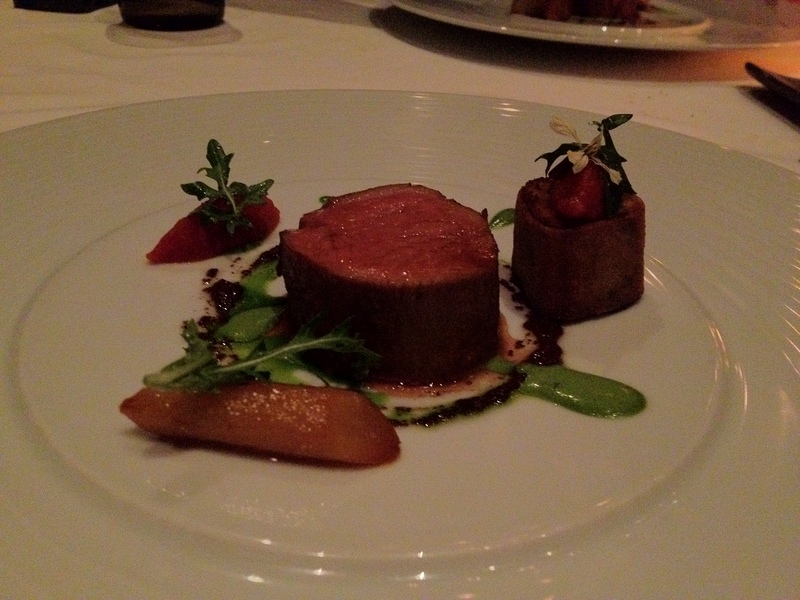 The veal was EXTREMELY tender, and it tasted like wagyu. I don’t quite understand how they got it to be that soft—it didn’t quite melt in my mouth, but it was close enough. (I actually liked that it didn’t quickly melt in my mouth like really good wagyu can, as part of me enjoys chewing meat a little.) The salsify and potato hash added some crispness for more textural variety, and they added more flavors to keep me from getting sick of the veal. Well-cooked veal is amazing ^___^. 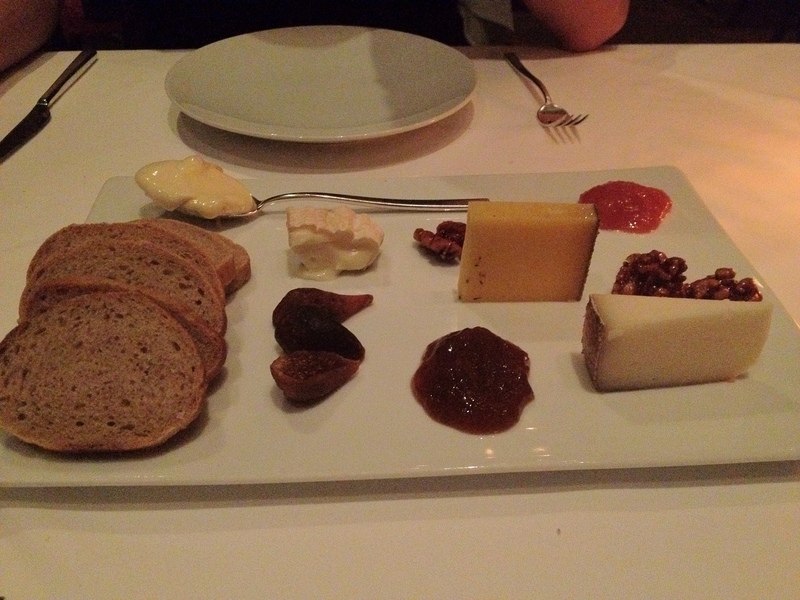 I really enjoy eating Époisses (one of Napoleon’s favorite cheeses! ), so I asked for that one first haha. I forgot about the other three were, unfortunately :(. It’s okay, though! AS LONG AS WE REMEMBER ÉPOISSES, IT’S ALL GOOD. with cucumber, lime, and coriander. 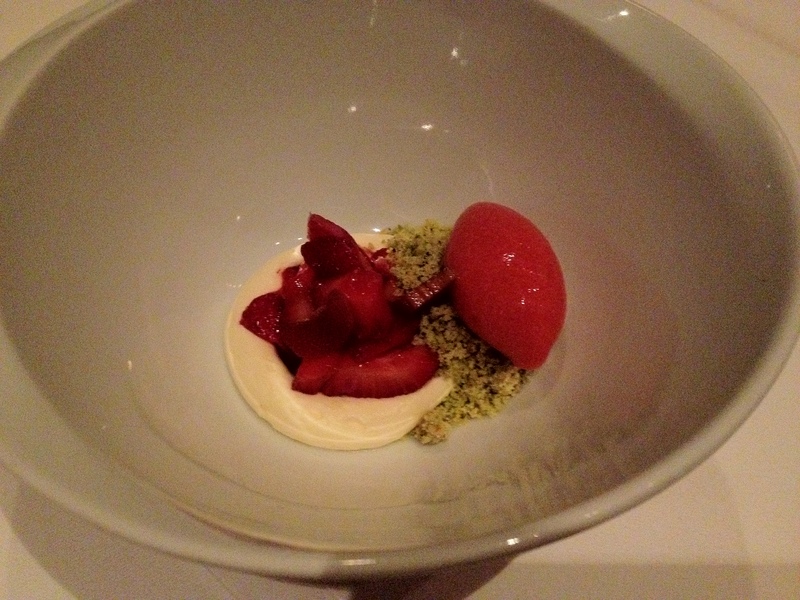 with white chocolate/rose water mousse, pistachio praline, braised rhubarb, and strawberry sorbet. This was surprisingly delicious. There was a really good variety of textures due to the creaminess of the sorbet and mousse, the soft chewiness of the rhubarb, and the crispiness of the pistachio praline. 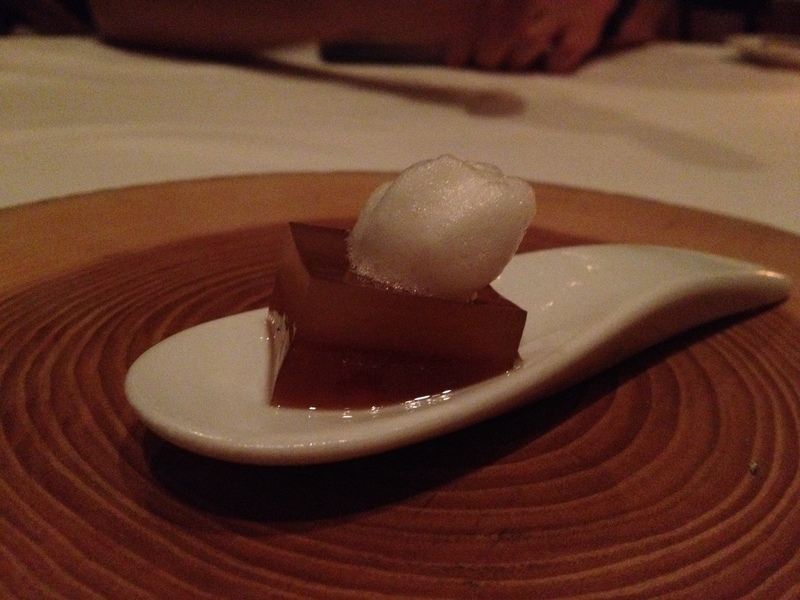 Also, this dessert wasn’t too rich at all—the acidity from the rhubarb helped cut down on that. The creamy mousse helped to serve as background flavoring for the dessert instead of overpowering the other ingredients—this dessert felt more like a mix of pistachio, rhubarb, and strawberry, with the mousse in the background. When I mixed and ate all of the ingredients together (surely violating some law of the universe somewhere), the result was this mouthful that was both creamy AND crispy—and all the ingredients worked together wonderfully!